Creating a real tile mosaic on almost any surface top is easy. The first step would be to look in a tile shop and see what is available. Then decide on a pattern you want. There are many books, magazines and TV shows that give step by step instructions as well as design ideas. After deciding a pattern or design, sketch your pattern on the surface you are going to tile over. The first step is to prepare the surface making sure the tile will adhere. You do this by scoring the surface with a utility knife then coating the surface with a mixture of watered down white glue. Next you take tile cement, commonly known as thin set or mortar, and spread a thin coating over the surface. Place your tiles in the cement according to the pattern you drew. After the cement has set, (don’t be in too big of a hurry) fill the gaps between the tiles with tile grout. Most people think grout is available only in white but if you look in a hardware store you’ll find many different colors of grout available. You apply the grout by simply troweling it over all of the seams between the individual tiles. Then wipe away the excess with a sponge. Have you ever been in a cafe, restaurant or a friend’s house for that fact, and admired the mosaic tile on the tabletops or walls? Well, it’s not that hard to bring that look into your own home. Where’s a good place to add a mosaic in your home? Kitchens and bathrooms are the obvious choices but end tables and patios have become favorites too. Consider embellishing a coffee table purchased from an unfinished furniture store. This is a great little week-end project. All you have to do is add a coat of paint and then make a small mosaic on the tabletop using some different size tiles or even broken tile pieces. This same technique works equally well for a larger area like this as it does for a small accent table. Before starting this project, there are some things you should do first to be prepared. Take some time researching what you want to do before you start laying tiles down. There are tons of books on ceramic tiles at your bookstore or library. A recommendation is to just thumb through them to get some inspiration for your design. Once you have a basic idea of what you want to do, it’s always a good idea to draw a sketch of your design. Then you will want to place the actual tiles on the countertop, starting from the center and working outwards, to make sure your pleased with your design. Once you have everything in place, take a magic marker and mark the tiles’ location. Before you cement the tiles in place, you have to prepare the tiles for the mosaic sections. How do you do that? This is where you can get some aggression out. Take a mix of tiles, wrap them in a towel and give them a whack. This is the simplest way to get the broken pieces of tile you’ll need for the mosaic. For the border mosaics you are going to need some smaller pieces of tile. For the smaller pieces you use a tile nibbler to break off pieces the size you need. To cement the tiles in place, use mortar that you can buy at any tile store or home improvement store. You just trowel the mortar on about 1/8th inch thick. Then use the edge of the trowel to score the mortar. Then just put your tiles in place. For the mosaic sections you use the same process. Take the different pieces of tile and arrange them however you like. Try and keep the spaces between the tiles to 1/8th of an inch. How do you finish the project? You have to grout the tiles after the mortar has set up or dried. Remember, tile grout is available in many colors, not just white. Next smear the grout over the top of the tiles filling in the seams. To clean the tiles, wipe off any excess grout with a sponge. Let it dry overnight and you’re done so sit back and admire your work of art! Have you recently made the decision to remodel your kitchen? If so, what would you like to have remodeled? There are some homeowners who only choose to have a specific part of their kitchen remodeled, but then there are others who want everything changed. Whether you want to only improve a small part of your kitchen or if you want a completely different kitchen, there is a good chance that you may be looking for a new kitchen countertop. If so, have you decided on which type of countertop you would like? Granite is usually the best choice for homeowners. While there is a chance that you may already know what type of new kitchen countertop you would like to have installed, there is also a chance that you may not. If this is the case, you are advised to start shopping. Whether you look for kitchen countertop materials online or in one of your local home improvement stores, there is a good chance that you will come across a wide selection of materials, all with different designs and styles. Shopping or at least browsing is one of the best ways to get ideas. In fact, doing your shopping and browsing at the place where you plan on buying your remodeling supplies from is a great way to get price estimates, which are essential when kitchen remodeling is being done a budget. Summer is finally here, and many of us are eager to get our home renovations underway. With so many project options available to the average homeowner, it is often difficult to determine the most cost effective home improvements. This is especially difficult for people that are trying to ready their homes for sale. One of the simplest and most cost-effective home improvement projects is the kitchen makeover. American families spend a lot of time in the kitchen, and those shopping for a new home place a lot of emphasis on kitchen design. If you are keen on updating your kitchen, whether for your family or for a potential buyer, the following tips can help immensely. There is no need to replace your kitchen cabinets, if they are constructed from real wood. Most people love the idea of natural wood cabinets so instead of replacing them, why not consider updating them? Changing the hardware is a simple way to give your kitchen cabinets an updated look. There are countless styles and designs available, and most of them can be had at extremely fair prices. Adding a fresh coat of paint can do wonders for the appearance of your cabinets. It is simple enough to remove the cabinet doors and repaint them. Be sure to clean them properly beforehand. A light sanding will also help ensure that the new paint adheres properly. There are so many colors of paint to choose from. Consider using one of the antique finishes that have become so popular in recent times. A quality countertop is another viable option for upgrading the appearance of your kitchen. A marble or granite countertop may seem like an expensive upgrade, but if you are selling your home this simple upgrade could close the deal for you. If you are not in a position to consider marble or granite, ceramic tile is the next best choice. The wonderful thing about using tile for a countertop is the freedom that you have with the design. Mosaic tiles have never been so popular, so don’t forget to let your artistic side run wild. If you can’t stand the look of your bathroom vanity and want to breathe some new life back into it, you should consider trying to spruce it up. Aside from what you may have heard, an old bathroom vanity cabinet can be overhauled with little to no money. While you could always invest in a new cabinet, you’d be amazed at the kind of satisfaction a small amount of elbow grease and time can bring about. Probably the most lucrative option for those with an unsightly bathroom vanity cabinet is to paint it. Most bathroom vanities can be painted with standard paints available at home improvement stores. If you’re unsure as to what type of paint your project will require, it’s best to talk to an employee at your local home improvement store. The employee should be able to give you some insight into the materials you’ll need to execute your project. If painting’s not something you’re looking forward to, you should consider replacing the hardware on your vanity. Swapping out your bathroom vanity cabinet’s old hardware, with new and shiny hardware can bring about astonishing results. It really doesn’t take much to revitalize a room’s focal point. If neither the above options appeal to you, you have the option of replacing your bathroom vanity’s countertop. The countertop is one of the bolder elements of a countertop and can thus work to enhance its appearance or utterly annihilate it. If your vanity’s current countertop is simply no longer cutting it, you should seriously consider replacing it. Those that are willing to spend more money should consider purchasing real stone countertops. If the budget’s a bit tight, you can also go with a laminate countertop. Both will get the job done – just at varying prices. Giving your vanity a new look isn’t as hard as it initially appears. If you’re willing to dedicate a little time and patience, the possibilities for revitalizing an old vanity are endless. Marble – Another natural stone, marble is considered to be the height of elegance and will last longer than most kitchens. It is however, is very expensive and requires some care: acidic foods such as orange juice will etch the finished surface of a marble kitchen countertop. Concrete – This is one of the biggest trends in kitchen countertops today. It is a good look for clean, industrial and contemporary kitchen designs. Available in pre formed sections or poured and formed on-site. Concrete is a good material for unusually shaped counters. Concrete kitchen countertopsare expensive, require a sealant and must be treated with care. The countertop can crack if the concrete should contract. Concrete can be stained any color. The most popular color is a natural gray tone. The top layer can be finished as desired. Corian – A solid surface material that first became popular in the 1990’s It is highly recommended by kitchen countertop experts. It is a totally manmade product and is not porous. As a solid surface it can easily be repaired if scratched or burned. Stainless Steel – Advantages include very hygienic, easy to clean, has ability to stand up to exteme wear and heat. Stainless steel can provide a great look for an ultra modern kitchen. Some disadvantages with stainless is that it can be noisy and that scratches can develop. Tile – Tile surfaces can be tough, hard-wearing, takes hot pans, heat and stain resistant as well as beautiful. There are many types of tiles including ceramic, porcelain, quarry, glass, natural stone and mosiac. Available in many colors, sizes and textures. It has good design flexibility. Tile can often be used for trim or backsplashes. The downside of tile is that the grouts can be easily stained. Also the tiles can become chipped or cracked. 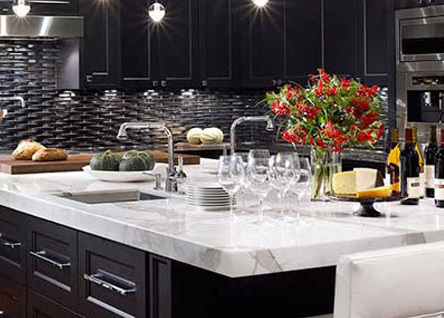 Ceramic tiles for kitchen countertops have become a must have in home buyers’ kitchens. Whether you prefer glazed, porcelain, quarry or mosaic, these tiles are versatile and come in an array of designs, colors and shapes. A design savvy look, country flair, artistic interest or upscale appearance can enhance your kitchen countertops surface that’s low maintenance but high in style. Tile countertops are also a great idea for completing your kitchen renovation since tiles are not only durable but are heat resistance. It seems though more and more home buyers are demanding granite kitchen counter tops. Granite provides a beauty and warmth and it is ideal for aesthetic appeal in home design. Granite and its popularity are a little pricey with prices starting at 60.00 a foot installed. Although they are very popular, solid granite countertops may not be for everyone. A homeowner may not be willing to pay the price because of limitations on resale value. In situations like these you can always go to the granite tile countertops as an alternate means. The granite tile countertops are designed from the same desirable stone as the solid granite with all the desirable elements remaining the same. Granite tile countertops can withstand putting hot pots/pans on the counter. They also serve as an excellent surface for handling dough and confectionery. Granite tile countertops have such a natural beauty that compliments almost any style cabinetry. Granite tiles are very versatile and offer a wide range of ideas and options for installations. If you are not wanting to install granite tiles all over your kitchen consider doing just your island top for a focal point and conversation piece. These will make the tiles pop against the design choices you have made in your kitchen. Granite tiles provide a great choice for the homeowners who are trying to do kitchen remodeling on a budget and can easily be done as a week-end project. The practicality choice of granite tile countertops can be set into any other material including laminated counter tops or solid wood. Clever design plans allow the homeowner to present their own style and taste without great expense. The granite countertop appeal can not be compared to any other.